In this video, Paula Kaufman, Dean of Libraries and University Librarian, University of Illinois at Urbana-Champaign, presents a case study of how the second largest academic library in the United States undertook a far-reaching transformation. The drivers for change included adapting to user needs, and saving money and maintaining the quality of the collections while increasing the scope and quality of its services. Five years ago, they began taking a critical look at the 45 libraries on campus, many of which were discipline specific. They solicited ideas from faculty and staff, hosted discussions, produced a final report, and charged teams to found and implement new service models. As a result, libraries were closed or consolidated depending on usage, and a number of subject librarians became embedded alongside their discipline’s faculty. Space was returned to the Chief Academic Officer for reallocation, or the library repurposed into collaborative environments, including both a learning and scholarly commons. The library not only transformed by reexamining existing space, services and collections, but also formed partnerships to meet growing needs such as the curation of research data. The BTOP program has provided a combination of computers, software, assistive devices, network hardware, staff funding, broadband upgrades, and digital literacy training to 43 public libraries with the goal of improving access to the Internet at public libraries. 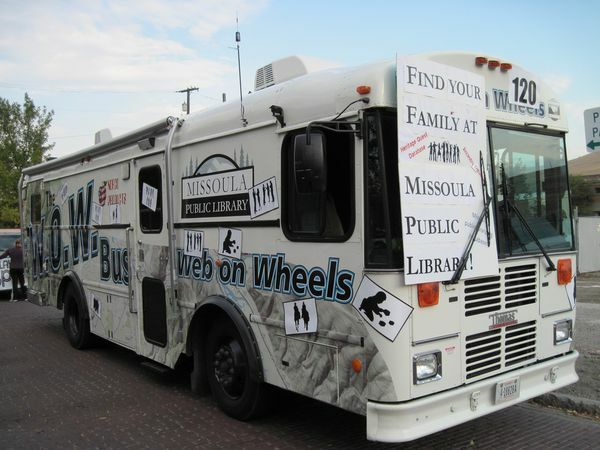 Bringing Technology to Montanans － 這台Web On Wheels Bus 不能叫做 Bookmobile(移動圖書館)，應該說是 Computermobile，簡直就是移動"網咖"
This entry was posted in 研討會、行銷、圖書館 and tagged 移動圖書館、leadership by ted. Bookmark the permalink.